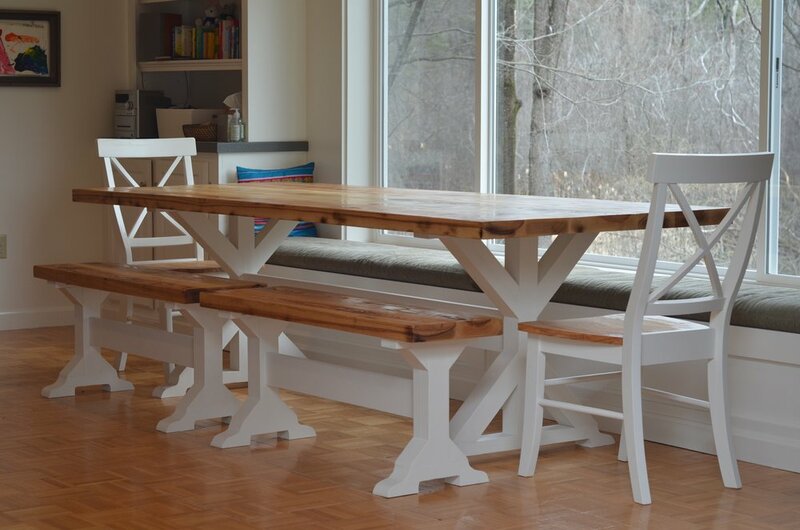 Based out of beautiful New Gloucester, Maine - Rowe Station Woodworks specializes in hand crafted furniture and decor made to last generations. Taking many timeless techniques and joinery, merging it with modern technology and methodology, we pride ourselves on making pieces that will turn your house into a home. It all started with the dining table - it is the center of a home. It is where memories are made, laughs are shared, homework is done, tears are shed, drinks are spilled, bread is broken. Once someone sits at your table, you have welcomed them to a special place in your home. It is the reason we started our business. We love collaborating to make the perfect piece for your home and a cherished possession that will be passed on from generation to generation. Born and raised in this beautiful state - we take great pride in the rich history, breath taking landscapes, unpredictable weather and everything that is Maine. It truly is the way life should be, and we incorporate this culture and history into the pieces we craft. No two spaces are the same, and no two pieces we craft are the same. We ensure that we get to know each person we meet and what is important to them. We become partners throughout the whole process and not only work for you, but work with you on completing the project of your dreams. Preserving history is an integral part of the work we do. Whether we are using materials from 200 year old barns or repurposing an antique piece of furniture, we strive to continue heirloom techniques that will respect our history and last for generations. Want to say, "Hi?" Or collaborate on a project? Please fill out the form below. You can also email us directly at info@rowestationwoodworks.com.